I decided last night on the final trim and jewelry options, and am now trying to figure out packing and hoping I don’t forget anything. I have nightmares about arriving at an event out of town without my stays! 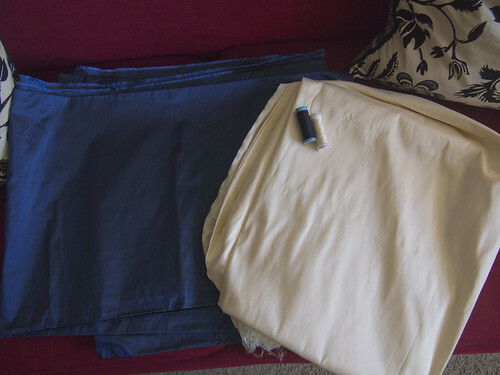 I spent this morning wrestling with silk taffeta, trying to tame it into a skirt. I think (fingers crossed) that I’ve succeeded. 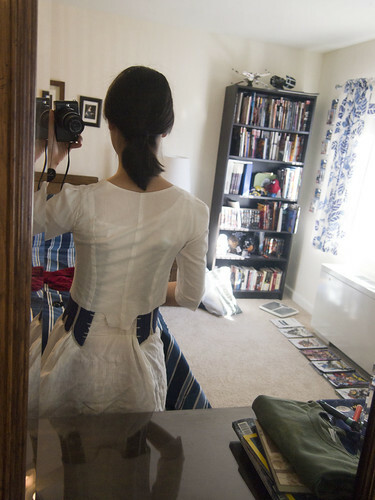 The skirt is only pinned on right now, but it looks right. 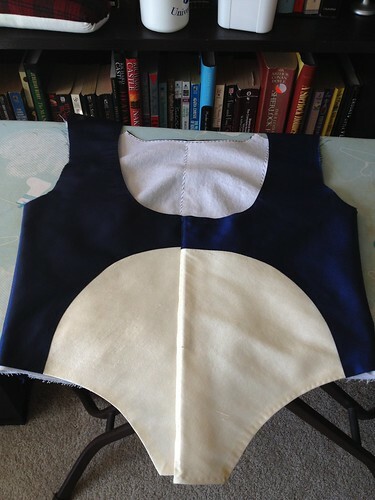 Now to sew the darn thing on. Guess what I’m making for the Francaise Dinner? I’ve been working on this off and on since December, but I’ve only been sort of motivated about it. 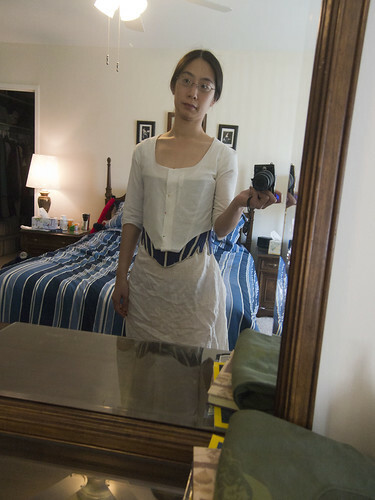 Seeing everyone in all their finery at last weekend’s card party has put a little more inspiration in my head, and now I’ve made some visible progress. As it stands right now. 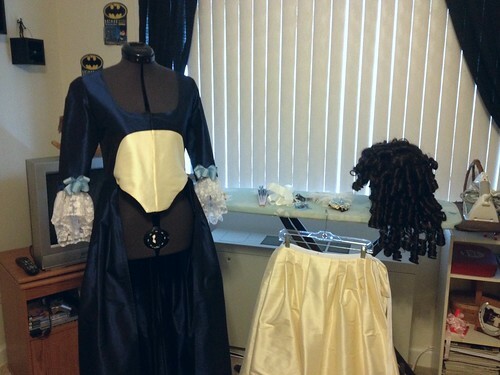 I need to finish lining the front and then sew the sleeves and shoulder straps. Mock up, back in December. 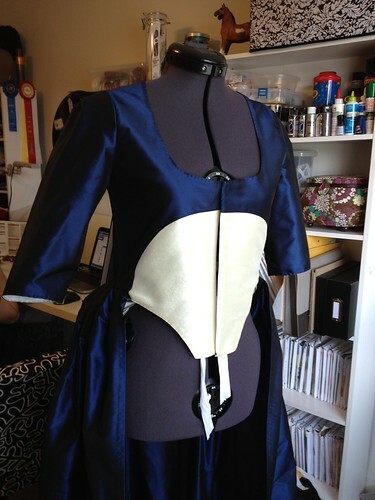 I added some ease to the back over the shoulder blades, because my last silk jacket I made using this pattern was a little tight there. 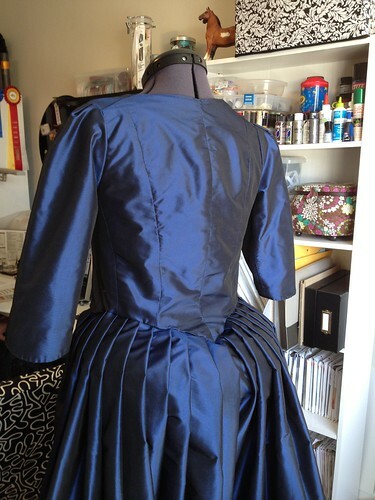 The pattern was originally fitted for cotton fashion fabric, so the lack of give in silk creates more tightness. Hope it works.